The COP21 (Conference of Parties 21 aka 2015 Paris Climate Conference), was supposed to, for the first time in over 20 years of UN negotiations, achieve a legally binding and universal agreement on climate, with the aim of keeping global warming below 2°C. The dust is beginning to settle on the COP 21 agreement. Leaders and negotiators have gone back to their homes, calling it a “historic turning point”, and that they have “taken vital steps to ensure that our children and grandchildren will see that we did our duty in securing the future of our planet”. Let us look at what really happened: An agreement was arrived at which, for the first time, articulated the need to hold the “increase in the global average temperature to well below 2 °C above pre-industrial levels and to pursue efforts to limit the temperature increase to 1.5 °C above pre-industrial levels, recognising that this would significantly reduce the risks and impacts of climate change” (Article 2 of the Paris Agreement).This is a significant step, moving away from the ostrich-like attitude of the past where leading historic greenhouse gas contributors notably the United States, were in denial. We have a problem right from the start. The disconnect between the intent and the commitments to meet this intent continues to get wider—globally and nationally. Another significant point to note is that there are no legally binding requirements in the Agreement. What were the solutions discussed in Paris to meet the INDCs? At the COP 21, solutions to mitigate and adapt to climate change were being provided by corporations and technology providers who are contributors to climate change. They were on display in the Solutions COP 21, a large platform provided for them at the COP 21. Here, corporate sponsors were pushing solutions to climate change that include genetically modified foods, privatised water, and biofuels….more of the same. All the discussions, including those around potential solutions, were held without any inputs from civil society and communities who are adapting and living lives already impacted by climate change. They had to resort to protests and sit-ins to be heard even by world media. In the context of our food systems, Solutions COP 21 continued to push the industrial, agribusiness agenda in the name of climate mitigation and adaptation. Biofuels, which have already compromised the food security and sovereignty of millions of communities all over the world, find a place in the solutions proposed in Paris. At the top of the proposed solutions are genetically modified foods, privatisation of water and other industrial agricultural solutions. To paraphrase Einstein, we are once again trying to solve problems by using the same kind of thinking we used when we created them.Once again, technology is being pushed forward as the solution. Instead of actively seeking integrated, social and ecological context specific solutions of which technology could be a part, the same fragmented, industrial, silo approach is being proposed! A rapidly globalising India's climate action plan is not very different from that proposed by the developed countries and the corporations. Here is a look at some of the key proposals in India's climate action plan that have significant implications for our food security and sovereignty. One of the proposed actions for Green House Gas (GHG) mitigation is promotion of Biofuels (Section 2.2.8). National and international experience around biofuels has clearly shown the disastrous effect this has had on food security. Large-scale promotion of Jatropha and Simarouba glauca on “wastelands” has destroyed common lands which are the resource base for livelihoods and food systems in arid and semi-arid dryland areas. Biodiesels, the corn-based ethanol industry and their role in the 2008 food crisis has been extensively documented. Where is the integrated energy plan for the country? What is the role of biofuels in this plan? What are these biofuels proposed to be used for? Marginal and vulnerable ecosystems and communities in rain-fed, dryland areas of the country are invariably the targeted locations for biofuel cultivation. These are also areas most vulnerable to the impacts of climate change. The plan proposes a way forward to mitigate climate change through eight national missions. One such mission that has significant implications for our food systems and sovereignty is the National Mission for a Green India (Section 3.6), which is already underway in some of the most biodiverse regions of the country. The stated objectives of the mission: “increasing forest cover and density as a whole of the country and conserving biodiversity”. This is proposed to be done using “fast-growing” climate hardy trees. Whenever a programme is done in “mission mode”, it is characterised by targets, timelines and quick results, absence of democratic decision-making, or engagement with and involvement of local communities. There is no place for local knowledge and experience. Whether it is Green India or REDD+ (the global programme aimed at mitigating climate change), the action on the ground is raising monoculture plantations typically having commercial value like oil palm, eucalyptus, tapioca etc. It is about increasing tree cover and not biodiversity. It is about clearing, leveling and planting saplings mass produced in a central nursery, taking over local grazing lands and food sources and throwing people out….now called “relocation”. The recent approval of 100 per cent FDI in plantations including palm oil is a further step in this direction. The measure is expected to enhance domestic palm oil production so that it can continue to be provided cheaply through the Public Distribution System (PDS). 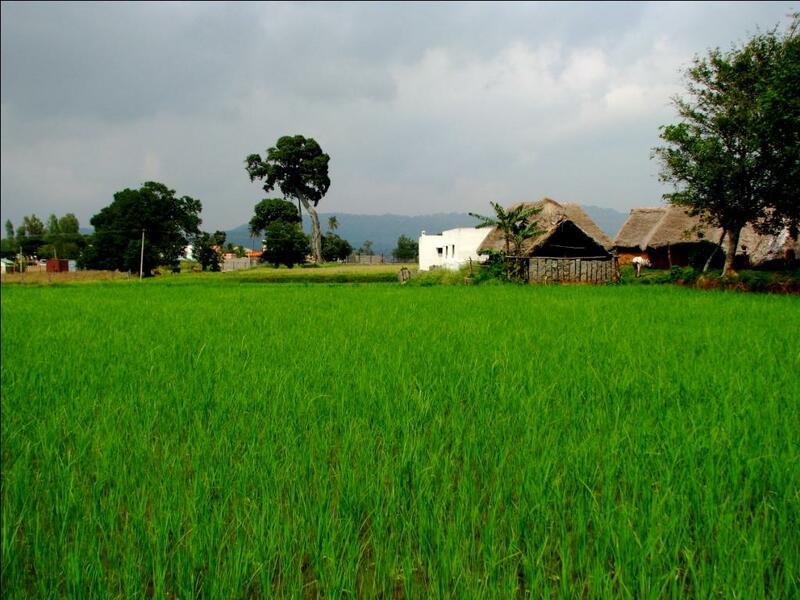 The ideal locations for these plantations are the rich biodiversity forest areas where adivasis and other indigenous communities live. The fallout of this policy measure will be destruction of resilient carbon sinks, release of greater carbon through clearance of these forests, loss of food, medicine and livelihood basis of these communities and increased malnutrition since they will have to depend on the poor nutrition provided by the PDS. To counter this malnutrition, genetically modified foods such as Golden Rice will be pushed by industry and an increasingly agribusiness-oriented government. We are already seeing the push for field trials for oilseeds such as mustard. This lays the foundation for the use of biotechnology (Section 3.7.4) to engineer C4 crops, drought and pest-resistant varieties action proposed as part of the National Mission for Sustainable Agriculture (Section 3.7). Drought and pest-resistance is being practiced by small farmers across the country using local varieties of crops and agroecological practices. The role of small farmers and agroecological practices in cooling the planet has been extensively documented by IAASTD (International Assessment ofAgricultural Knowledge, Scienceand Technology for Development) Report, 2005. There is no mention of any of this in the proposed plan. How is the data from the GIS (Geographical Information Systems)-based maps for soil resource planning and land use planning at the level of the watershed going to be translated on the ground? Under the ongoing Integrated Watershed Management Programme enormous amount of data has been collected but except where civil society organisations are active, this data does not translate in any way to “drought-proofing” small farmers and their livelihoods. Before investing in biotechnology to produce hardy and condition-specific strains of grains and animals, why not use the investment to support the propagation, maintenance and conservation of local drought-resistant, salt-tolerant crops and vegetable varieties that already exist with various communities? No initiatives seem to be proposed to conserve and support livelihoods and food systems based on local animal breeds. The domestic dairy sector is increasingly getting integrated into the global dairy industry resulting in promotion of large dairies and exotic breeds of milch cattle which are highly resource-intensive. Is this what the government considers climate-smart agriculture? In ecosystems made more vulnerable and unpredictable by changing climate conditions, introduction of genetically modified strains whose ecological impacts are unknown, exotic breeds of animals that are resource-intensive will make the situation much more vulnerable. There is no integration and cohesion between the various proposed missions. The National Water Mission (Section 3.4) “proposes to explore options to augment water supply in water stressed areas, integrated water policies to cope with variability in rainfall and river flows at the basin level”. Unless this is linked to land use, cropping patterns and practices, it is impossible to have an integrated strategy to address food security in an increasingly unpredictable climate. Interlinking rivers has already commenced in the country. From a climate change perspective, this is one of the most irresponsible actions that could be undertaken. What is perceived as a water-rich basin today could be water-deficient in the future. The south-west and north-east monsoon in 2015 showed us very clearly how unpredictable rainfall can be. What should be the strategy for mitigation of and adaptation to climate change? How can the disconnect between the commitments and the actions proposed on the ground be bridged? India has the opportunity to be transformative in its impact and show leadership by putting forth an integrated approach to climate change. The core of the strategy for food security and food sovereignty should be small farmers and decentralised and democratic food production, distribution and consumption. Food systems need to be viewed as a whole and must be location and culture specific. Extensive work by IAASTD and local experience has shown that small farmers can cool the planet. Support for decentralised, agroecological local production must be provided. Diverse, local and ecosystem specific varieties of food grains, pulses, vegetables including tubers and local greens, oilseeds, protein sources in the form of meat, fish, dairy products must be conserved. Land use policies including conservation of biodiversity, water management, building carbon sinks must be flexible to allow for local, context-specific approaches. For instance (i) Protecting and enhancing forest and grassland diversity using local knowledge, supporting cultivation of dryland crops in rain-fed areas including appropriate storage and processing facilities so that people can easily consume them. There is no dearth of local knowledge or experience in all of these areas; (ii) Mandating the implementation of the National Food Security Act across the country with decentralised procurement and distribution so that culturally-relevant food is made available. It is a well-established fact that industrial agriculture is responsible for 44-57 per cent of global greenhouse gas emissions. Unless this issue is addressed head-on, mitigation or adaptation will be a losing battle. India still produces a large share of its food from small farms with 60 per cent of the net-cultivated area falling under dryland/rain-fed areas. For any food security strategy for the future to be climate-resilient it must move away from the industrial, agribusiness model. It must push for a transformation to local, agroecologically produced food in small farms, democratically governed markets and an urban planning approach that integrates food production. We must take control of our food systems from the agribusinesses and assert our sovereign right to food. It is not a novel idea— families and communities in many villages, towns and cities in India are already working in this direction. Firstly it is not a legally bounding agreement. Secondly, climate change is not "global warming and carbon credits". Fourth, the localized and regional changes associated with land & water use/cover changes [ecological changes] that affect health of lifeforms and weather.